Professional Sound Corporation® has been a leader in the design and manufacture of condenser microphone power supplies. The rugged, yet user friendly design has made them the most widely used power supplies on the market. With this in mind, PSC set out to design and build a new PSC 48 PHantom Microphone Supply specifically for use with the newer condenser microphones. Many of the new condenser microphone designs contain user switchable pads and low cut filters. Because of this, we have eliminated these functions from our new PSC 48 PHantom Microphone Supply. This supply utilizes a modern current control feedback regulator circuit to provide a constant 48 volts regardless of the current consumption of the microphone. Thus, it can power any 48PH microphone with ease and efficiency. 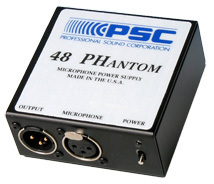 The PSC 48 PHantom Microphone Supply operates from a single 9V alkaline battery for 10 to 30 hours. The unit is housed in a rugged, black anodized, aluminum case. A sturdy, removable belt clip is included. 3.25" x 3.25" x 1.3"